Individuals, both in the corporate world and personal lives, get distracted by the juggling between the numbers of tasks in hand and the time frame to complete them. This leads to increased mental fatigue and demotivation among them. 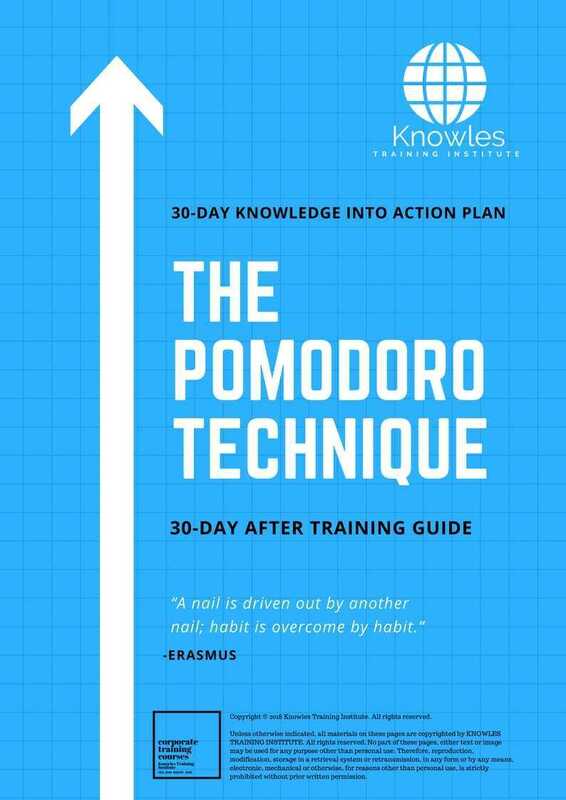 Knowles Training Institute is providing a life changing opportunity of learning Pomodoro Technique so that the individuals can take the reins of their life back in their hands. The individual has to prepare a comprehensive to-do-list at the start of the day and prioritize the tasks on need-to-do basis. Set a timer for 25 minutes and get your hands dirty on the first most important task. In order to avoid distractions, write it down and get back to them in break. After the timer has rung, the individual takes break of 3-5 minutes. After one pomodoro, put a checkmark on paper and after every four checkmarks take a longer break of 15 to 30 minutes. Repeat the cycle until all the tasks on the to-do-list are done. This the pomodoro technique workshop is ideal for anyone who would like to gain a strong grasp and improve their the pomodoro technique. The duration of this the pomodoro technique workshop is 1 full day. Knowles Training Institute will also be able to contextualised this workshop according to different durations; 2 full days, 1 day, half day, 90 minutes and 60 minutes. How a pomodoro technique can be practiced effectively at the work place? There are 3 pricing options available for this the pomodoro technique training course. Course participants not in Singapore may choose to sign up for our online the pomodoro technique training course. 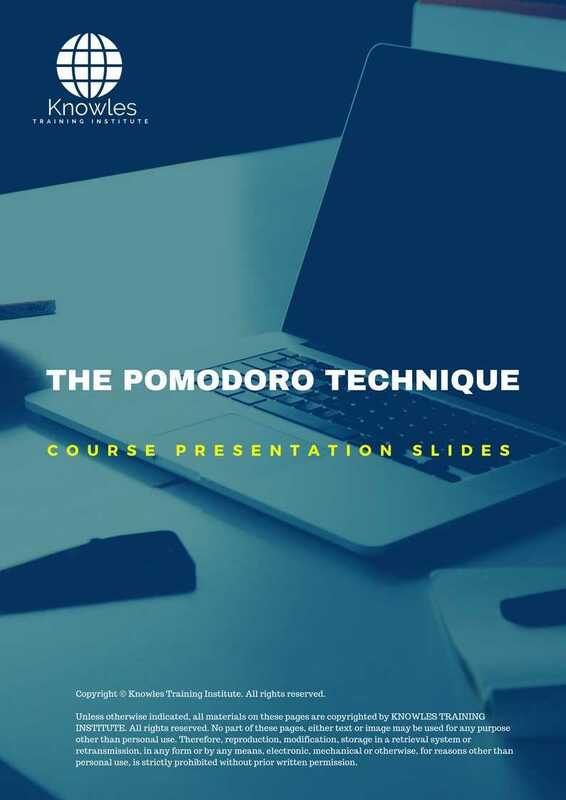 Request for this the pomodoro technique course brochure. Fill up the short information below and we will send it to you right away! Register For This The Pomodoro Technique Course Now! Share This The Pomodoro Technique Training Course! The pomodoro technique course, workshop, training, class, seminar, talk, program, programme, activity, lecture. The pomodoro technique courses, workshops, classes, seminars, talks, programs, programmes, activities, lectures in Singapore. The pomodoro technique improvement tips, The pomodoro technique techniques, improve The pomodoro technique, improve The pomodoro technique games, The pomodoro technique improvement exercises, improve The pomodoro technique power, how to have good The pomodoro technique, how to have good The pomodoro technique in studying, how to build up your The pomodoro technique, how to improve The pomodoro technique how to improve The pomodoro technique course in Singapore. Enhance, boost, build up, enlarge, heighten The pomodoro technique course in Singapore. Increase, intensify, raise, reinforce, strengthen The pomodoro technique. Upgrade, amplify, boom, elevate, exaggerate, magnify, grow, gain The pomodoro technique. Develop The pomodoro technique, multiple, power up, beef up, bolster, establish, extend The pomodoro technique. Invigorate, restore, step up, toughen, empower, fortify, regenerate The pomodoro technique. Rejuvenate, renew, escalate, expand, maximize The pomodoro technique. Powerful, mighty, impressive, competent, great, excellent, exceptional The pomodoro technique in Singapore. Superb The pomodoro technique. Super, superior, strong, solid, active The pomodoro technique training courses and workshops in Singapore. The pomodoro technique enhancement, booster, building up, enlargement, heightening, increment, strengthening, amplification. The pomodoro technique magnification, growth, development, power, empowerment, regeneration. The pomodoro technique rejuvenation, development, escalation, expansion. The pomodoro technique maximization, power training courses & workshops in Singapore.